Adaptor cable for iPhone5® & iPad mini®Timecode input cable for all Ambient Lockit Timecode prod..
Timecode output cable with 5-pin Lemo and BNC right angle plug 40cm..
Timecode cable unidirectional 5-pin Lemo to 5-pin Lemo 60 cm..
AMBIENT TC-I/O-RA cable, Lemo 5-pin to Lemo 5-pin right angled, unidir., Length approx. 60 cm, TC ou..
BongoTies are professional quality all purpose tie-wraps made of bamboo and natural rubber, with hun.. 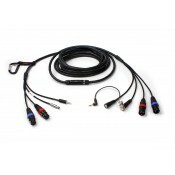 The K-4NN from K-Tek is a short XLR male to XLR female audio connector cable. 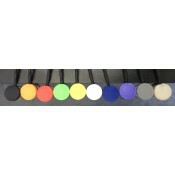 It..
CHECKBOX 1 - LAV Bullet with Lemo 6pol Audio Ltd. / TA Lectrosonics / Micron 46,80 € + VATCHEC.. Hoop and Loop cable.Ideal to use when you need to fold and organize your cables.Each cable holder co..
PSC adaptor TA5M - 1/8 Locking..
PSC 16¨ALEXA MINI AUDIO CABLE 5P LEMO - (2) XLR FE..
POWER STAR MINI NP-1 BATTERY CUP WITH PIG TAIL CABLEPSC NP-1 Battery Cup with 4-Pin Hirose Conn..
PSC Power Star Mini Output to Hirose 4 pin. 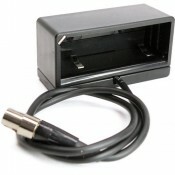 PSC POWER STAR MINI OUTPUT CABLE w/ HIROSE 4 PIN..
PSC Power Star Mini Output to USB Charge Port. USB charging port output cable for the PowerStar Mini. This new cable outputs 5Vdc at up to 1 Amp fo.. 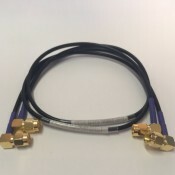 The pair of 20” RG174 Cables from Professional Sound Corporation features a right-angle SMA connecto..
PSC SMA R.A - BNC R.A.
Item#: CABETASD7KITENG breakaway assembly and Return Box for Sound Devices 7 series recorders.TA3F m..
Item#: CABETASD633ENG breakaway assembly with timecode for Sound Devices 633. Includes a dedicated t..
Item#: CABETACFP33ENG breakaway assembly.Standard XLR mixer end with standard camera end.20 feet.. 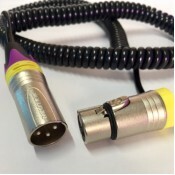 The Rycote 017013 S-Series Microphone Tail is a 3-Pin XLR cable that is suitable for use with Large ..
SOSE cable BNC -BNCAll our cables are made with the best quality materials (CANARE/ NEUTRIK /REAN), ..
SOSE cable COILED XLR (F) Angled - Minijack Locked 10cm NeutrikAll our cables are made with the best..
SOSE cable COILED XLR (M) - Minijack Locked 10cm NeutrikAll our cables are made with the best qualit..
SOSE cable COILED XLR (M) - XLR (F) 60cm NeutrikAll our cables are made with the best quality materi..
SOSE cable COILED XLR (M) - XLR (F) Angled 60cm NeutrikAll our cables are made with the best quality..
SOSE cable COILED XLR (M) - XLR (F) Low Profile 80cm NeutrikAll our cables are made with the best qu..
SOSE cable COILED XLR (M) Low Profile - XLR (F) Low Profile 80cm NeutrikAll our cables are made with..
SOSE cable Minijack - Ta3 (F) 40cmAll our cables are made with the best quality materials (CANARE/ N..
SOSE cable Minijack - XLR (M) 60cm NeutrikAll our cables are made with the best quality materials (C..
SOSE cable Minijack - XLR (M) Angled 40cm NeutrikAll our cables are made with the best quality mater..
SOSE cable Minijack Angled - XLR (M) 60cm NeutrikAll our cables are made with the best quality mater..
SOSE cable SMA - SMA..
SOSE cable Ta3 (F) - Ta3 (F) 40cmAll our cables are made with the best quality materials (CANARE/ NE..
SOSE cable Ta3 (F) - Ta3 (F) 60cmAll our cables are made with the best quality materials (CANARE/ NE..
SOSE cable XLR (M) - XLR (F) 1m NeutrikAll our cables are made with the best quality materials (CANA..
SOSE cable XLR (M) - XLR (F) Angled 60cm NeutrikAll our cables are made with the best quality materi..
SOSE cable XLR (M) -Minijack Locked 60cm NeutrikAll our cables are made with the best quality materi..
SOSE cable XLR Hybrid - Minijack 80cm NeutrikAll our cables are made with the best quality materials..
SOSE cable XLR Hybrid - Ta3 (F) 60cm NeutrikAll our cables are made with the best quality materials ..
SOSE cable XLR Hybrid - XLR Hybrid 80cm NeutrikAll our cables are made with the best quality materia..
SOSE cable XLR Low Profile - Ta3 (F) 40cm NeutrikAll our cables are made with the best quality mater..
SOSE cable XLR Low Profile - XLR Low Profile 40cm NeutrikAll our cables are made with the best quali..
Cable to feed timecode from your Tentacle to RED Cameras, excluding RED One. This cable is compatibl..